The truth is, I can't show you what I'm currently working on due to its being a surprise for someone from the person who commissioned it, and on the very slim chance that that person might actually read this blog, I can't post the pictures yet! So this will have to do for my creative offerings for today. Once a month, I do art lessons with my home-schooled nephews, and January's project was papier-mâché. I unfortunately do not have any photos of the pieces in progress (due to the hazards of touching any type of electronic equipment while completely covered in Elmer's glue mixed with water - let me just warn you - papier-mache with three kids and one overly-ambitious, grown-up craft nut is not unlike a somewhat-controlled trainwreck..Do it outside if, like a normal person, you decide to make your pumpkins in September rather than January), so we'll just have to make do with the after photos... I will give you some brief instructions, however. Not quite up to snuff, but it was a rather long day, and I gave out about midnight - there's only so much Elmer's glue that already-chapped hands can take, anyway (I should add here, that the poor little children were NOT kept up doing papier-mache until midnight. No, they were taken home by my sweet husband, who was not covered in Elmer's glue, and had their dinner and were put snugly to bed at a reasonable hour). But I think they're okay - kinda quirky and lumpy, but I think they'll look cute tucked in around my other fall decorations (when fall actually rolls around again). (I'm talking about the pumpkins again now- not the kids, who are not lumpy and will not be tucked around in my fall decorations). balloons, cardboard, toilet paper/paper towel tubes, etc. For other forms, you can fashion them with wadded up and taped newspaper, cardboard, ballons, or a combination of all three. Just make sure they're taped together tightly so they hold the shape. Once you get your form created, then the messy part begins. Mix 1 part glue with 1 part water in your container and stir well. Then, you simply begin dipping your strips of newspaper into the glue mixture, "squeegee" off the excess with your fingers, and begin layering the wet strips over your form. Be sure to overlap each piece with the next, and make sure that they are tightly pressed to the form with no "bubbles" or loose ends flapping. It's best to completely cover your form with about 2 layers of paper, then allow it to dry before adding more. (If working with kids, you may want to spread the project out over several sessions - they get restless, and allowing it to dry before adding more layers will help with the final results). Once they are thoroughly dry, you can paint them as you like! I used acrylic craft paint... and may touch them up a little still. The green lines are a little too prominent, I think. But we'll see... I've got other things I should be working on! 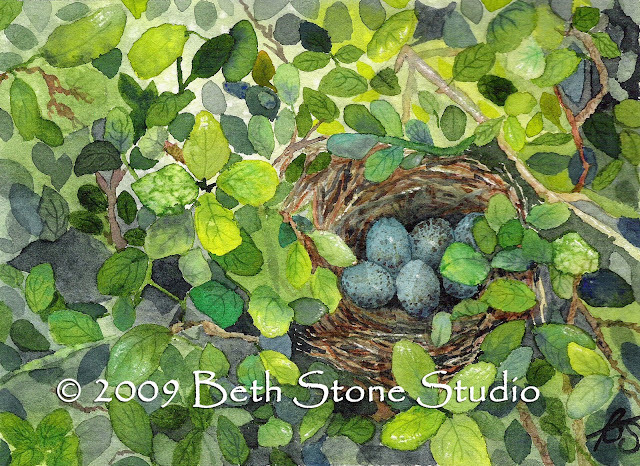 In other news, I was honored to have my watercolor, "Sparrow's Nest," featured on the Christian Artists Street Team (CAST Team) on Etsy blog today. The direct link to the post by Phyllis Ducey is HERE. 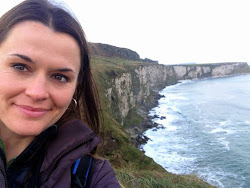 Her post, "Word Pictures," discusses the fact that throughout the Bible, God uses "word pictures" to illustrate Truth. Creation itself is full of evidence that is pointing us to our Creator, if we just have eyes to see it. A driving goal behind all of my work is centered around this concept - I hope that if you see anything beautiful or appealing in my artwork, it will point you back to the One who inspired it, whether it's a little attempt at conveying the beauty of His Creation, conveying the message and images from a great and theologically-sound hymn, portraying some aspect of what it means to be a godly woman, or some other Truth from Scripture. So, I'm excited and honored not only to have been featured on the CAST blog, but also because Phyllis saw in my work the quality that I am striving to put into it... yay! You know that I *HAD* to comment on a post about *pumpkins*! I *LOVE*LOVE*LOVE* the pumpkins - not enough to get my hands covered in glue (crafting drop out that I am), but the finished product is super cute! Congrats on the picture/Etsy thing. You're really making a name for yourself (the billboard, ballet art, stolen art, and now Etsy)! Congratulations on your success! Blessings.